I believe from Rocky 5. Categories: Uncategorized	Tags: I believe from Rocky 5. …the above is based on a true story. It is amazing how busy we can become. It is also interesting how we can miss opportunities that are right there in front of us. We can get ensnared in our patterns of thought and activity. People many not realize the opportunities because we all have blind spots. For that reason, it is common to hear the statement “I have no time for ______” and we have all heard or used something to fill in that blank. “No Time” becomes the excuse. At the very fine Wisconsin Housing Alliance (WHA) seminar held 11 days ago, Tim Connor shared the fact that the ‘average’ person spends 30,000 hours during the course of their adult life commuting, running errands and generally in driving mode. That seemed like a high number at first. But after a quick check, it certainly seems very plausible. Drive time alone represents ‘some time’ available for educational or inspirational listening. Imagine a person who used their drive time for listening to positive and useful information has the time needed for earning 8 college degrees! So we all have plenty of time indeed! We simply have to look for it. With the advent of MP3 players, IPods or the ability to burn CDs from internet downloads; a wise professional can effectively use that 30,000 hours of drive time. By listening to good information, you have the opportunity for building your skills or learning items you can share with your team. Let’s see, on the one hand…listen to the radio, or on the other hand, learn more to earn more. Are you already listening to financial or other news in your car, or while exercising or walking? Then you should also listen to Factory-Built Housing Industry News at Noon! Through a simple registration, you can now download feature articles each month from our online industry trade journal, PLUS you can download Factory Built Housing Industry News at Noon with Erin Patla. Or you can listen online from your home or office. is our first of what will be Industry business news daily via download or online here at www.MHMarketingSalesManagement.com/podcasts/. 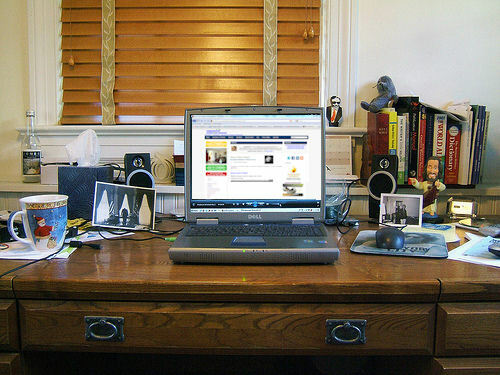 One loyal reader of MHMSM.com has already emailed in to say, ‘This (the podcasts) are a great service. I can listen to industry news and a feature article every day as I’m getting ready for work.’ (lightly edited). Starting as a young man in sales, and on through my management career in this industry, listening to audio recordings while driving was and is a great way to learn new ideas, to stay refreshed on concepts or to get and stay motivated. One business owner some weeks back explained in an email how he creates rewards and ‘a quiz’ for this team, to encourage them to learn and improve from the information they find here at www.MHMSM.com. Imagine having so many top professionals in our Industry available for reading OR now listening via podcasts! 30,000 hours of available time. How are you and your team members using them? You and your business are either growing or shrinking, there is no in between. You and your team are either getting better or getting rusty. There is no better way to knock the rust off the mental wheels than by challenging yourself and your team with good, positive information! Besides, as another reader turned listener here put it, podcaster Erin Patla’s “…voice is simply delightful.” When my wife says that Erin’s voice is great, that is an important insight indeed. 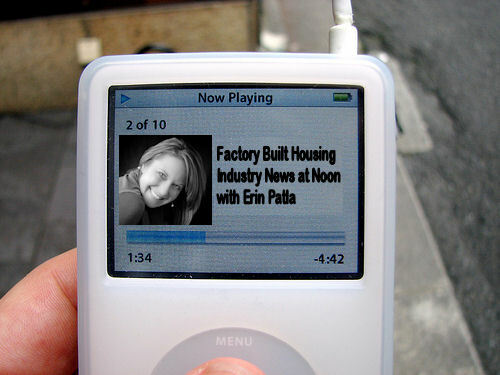 Now you can read Industry news, or listen to podcasts of top Factory Built Housing Industry News at Noon, or do both! The Industry is slowly turning an important corner. You can see it in reports and feel it. When would you like to start selling more homes? When would you like to start filling vacancies? Or doing better marketing? When would you like to have a team member improve their management skills? Doesn’t using drive time wisely make good sense? Does now sound like a good time to start these career building habits? Start your first download or start listening online at your home or office today. Actions speak louder than words. 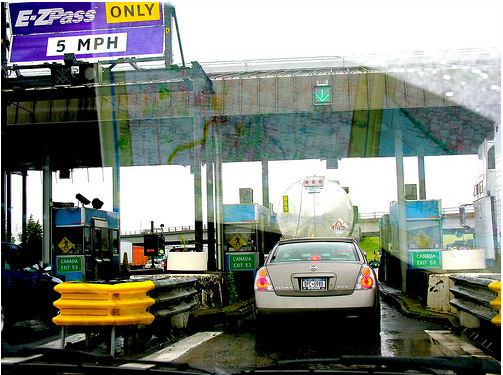 Think about those two toll booth workers…and think about the pros who will be listening as well as reading Industry news and views you can use. Will it be you, or your competitor that does the listening, learning, knowing and growing? Who will be stuck in the same rut? Why not take advantage of the opportunity for building a brighter future! Listen and learn! A few times every year, I get back to basics by listening to the classical Earl Nightingale recording of The Strangest Secret, the audio recording that launched the self-help industry. Here it is in video form for those who may not have seen it – or who, like me, want to hear it again. This video includes a reading of the poem ‘In Flanders Fields’ by Lt. Col. John McCrae and the well known excerpt from the poem ‘For the Fallen’ by Laurence Binyon.